Named in honor of Dr. James Naismith, the creator of the game of basketball, the first Naismith trophy was awarded in 1969 to UCLA’s Lew Alcindor, later known as Kareem Abdul-Jabbar. The trophy was sculpted by Marty C. Dawe of Atlanta and has become among the most prestigious national honors awarded each year to top basketball players in the nation. The Citizen Naismith Women’s Player of the Year Award was first given to Anne Donovan of Old Dominion University in 1983. Each year the club’s board publishes the “Naismith Watch” list that is made up of the top 50 players to watch in men’s and women’s college basketball. The organization also releases a list of 30 mid-season Naismith candidates. 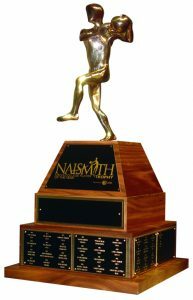 At the end of the season the Citizen Naismith Trophy is awarded to the player of the year in men’s and women’s college basketball. A national voting academy of leading basketball coaches, administrators and journalists narrows the group down to four finalists based on player performance throughout the season. The final four Naismith finalists will make up the ballot and the player of the year is voted on by the group. In 1982 the Atlanta Tipoff Club established the Outstanding Contribution Award to honor men and women who have had a positive impact on the game of basketball. 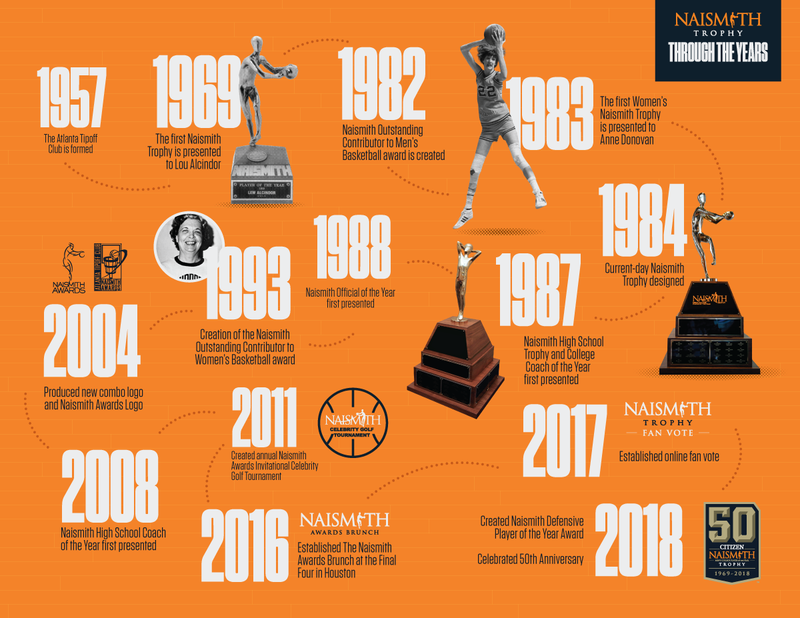 The Naismith Men’s and Women’s College Coach of the Year Award were established in 1987 and were originally given to the coaches of the men’s and women’s NCAA Division I Tournament Champions. In 1989, the governing board changed the selection criteria to the voting process used today in which the Atlanta Tipoff Club’s Board of Selectors first votes to compile a top 25 list of coaches for each award. Then, through additional votes, the list is narrowed down to four and finally, the national winner. Also in 1987, to honor the nation’s best boys’ and girls’ high school basketball players, the Naismith Trophy Boys’ High School Player of the Year and the Naismith Trophy Girls’ High School Player of the Year were established. The board compiles a top 10 list of players from across the country for both awards. The winners are then selected by board vote. The Naismith High School Boy’s Coach of the Year and Girl’s Coach of the Year categories were added in 2008. In 2018, the Men’s and Women’s College Defensive Player of the Year was added to the Naismith family, with Jevon Carter and Teaira McCowan taking home the inaugural awards. The Atlanta Tipoff Club was founded in the late 1950’s as a way for local basketball enthusiasts to share their love and enjoyment of basketball. The mission of the organization is to promote, develop and celebrate the sport in metro Atlanta and throughout the state of Georgia. The club’s annual Naismith Awards recognize the top players and coaches in women’s and men’s basketball at the national, state and local level.